Clearly no actual Ninja would paint himself (or herself) bright green and stick a loud exhaust up their catalytic converter. The Kawasaki is not a subtle bike to look at. Love it or hate it, the styling certainly has impact and this one, with its Tom Sykes replica graphics looks the best of the lot. Although personally, I’d be tempted by an all-black stealth version to keep myself out of the spotlight. Now, the ZX-10R has definitely been overshadowed by the technology overflowing from the latest versions of Aprilia, Ducati and BMW 1000cc superbikes. The Ninja makes do with simple, but effective three-stage traction control, optional ABS and an electronic steering damper – it’s almost analogue in comparison. It’s so easy to get caught up in all the latest buttons and dials, when the green rocket has plenty over the others without all that fuss. Don’t get me wrong, the electronic rider aid systems on the Aprilia, BMW or Ducati are fantastic and let you ride faster, safer, but for the sheer thrill of riding a 1000cc sports bike fast, the ZX-10R is hard to beat. 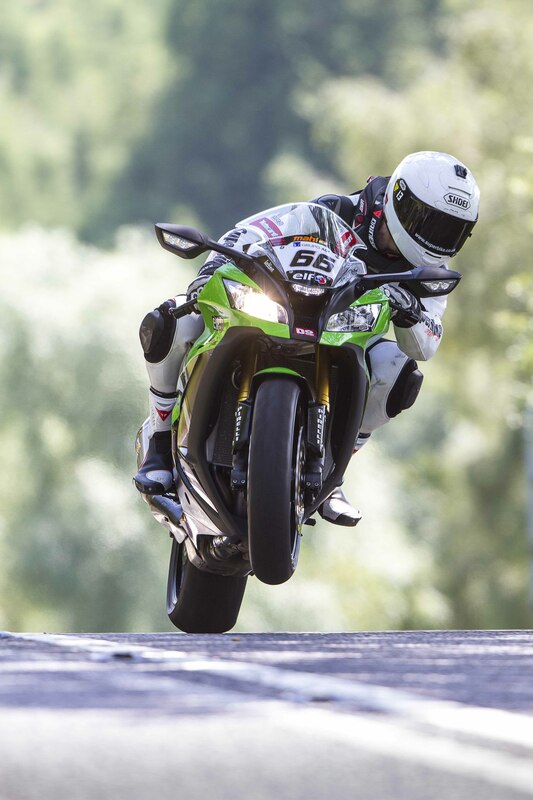 Ridden gently, the ZX-10R is a calm, sophisticated machine making brisk progress at your command. Square up to it, risk a provocative poke in the shoulder and it’ll break a bar stool over your Shark in a split-second. They don’t cover that on the Sharp helmet test I can assure you. I’ll be honest, there are a couple of bikes missing from this test – both Ducatis. The Panigale R we tested last month is by far the most insane sports bike I’ve ever ridden and it brings me out in a cold sweat and nervous giggles just thinking about it. I have complete confidence in saying it’s the motorcycling equivalent of Heroin. But we’ve covered that and the Kawasaki brings something different to the party, that surprise lurking at the top of the tacho as 200 horses wake up late for work and smash through the window in a blind panic. And in the naked bike class, the old Ducati 1098 Streetfighter was as mad as the Panny, just with less bodywork. Again, the Aprilia plays its game differently, taking on the 1098’s stonking bottom end power with a wailing V4 storm and sublime chassis to match. Superbike performance without the panels. Of the bikes we have here, I don’t think I’ve ever had a longer discussion to pick a winner. They each bring their own unique blend of madness to the table and a ride on any one will leave you grinning like an idiot. But after a couple of weeks of this nonsense, for me a winner started to emerge. It was the bike that did everything. The bike that I could ride flat out every day without going to prison. The bike that I did ride every day, rain or shine, because I enjoyed it so much. Yep, the Ducati Hypermotard SP. It doesn’t have the adrenaline rush speed of the ZX-10R, the continent crushing ability of the Hayabusa or the sublime handling of the Aprilia. Opening the throttle makes it wheelie, there’s no ‘I’ve just been hit by a truck’ acceleration like on the Rocket III. But the Hypermotard brings childish madness to every type of riding you do – there’s never a point where I wished I was on something else. 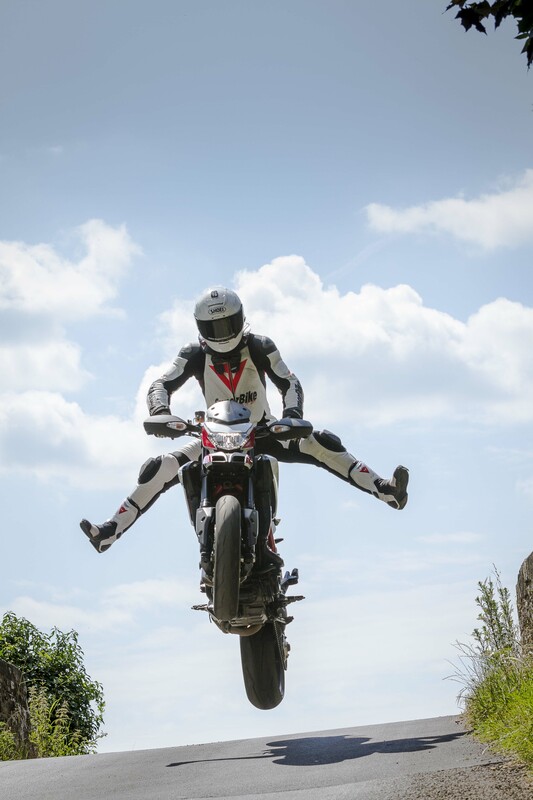 Yes it looks like a supermoto, but the madness covers a far wider spectrum than that. Try one, I dare you to behave. We persuaded a vicar to have a spin on the Ducati, five minutes later he’d become a bridge jumping maniac.